Putting our recent International issue (Chevy Classics, September 2015) together got me thinking about classic cars in unusual places. Seeing a ’61 Impala in Australia or a ’55 Chevy in Sweden is not all that unusual- after all, both of those countries are well known for housing plenty of classic American iron. Seeing a Roman Red 1960 Corvette cruising the streets of downtown London, England is certainly unusual though– especially one with California plates. Yes, our Chief Marketing Officer here at Eckler’s recently recounted this story to me. Or how about a ’55 Chevy convertible packed with locals roaming through the central Italian countryside? Our Director of Marketing here shared that curious tidbit of info once she knew what my “View” this month was all about. My brother, who is somewhat of a world traveler, recently sent me a picture of a brand new Ford Raptor pickup parked in the middle of nowhere, Bora Bora. Or how about this one? Years ago, my father told me he was standing on a street corner in downtown Amsterdam, and a ’70 Hemi ’Cuda rolled up to the lights– with Oregon plates! How does this stuff happen? However these unusual sights come to be, it certainly makes you shake your head and smile a bit! Do you remember that TV commercial introducing the “new for 1964 Chevrolet Impala”? 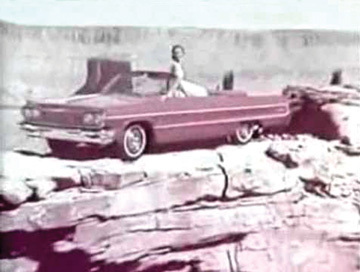 The one where a new convertible Impala sat atop a gigantic rock spire in Castle Valley, Utah? The narrator talks about how “Chevrolet for 1964 stands alone!” Again, quite the unusual setting. If you haven’t seen this commercial, check it out online: Go to youtube.com and enter: “1964 Chevrolet Impala commercial”. Have you heard about Cadillac Ranch? That lonely stretch of Texas highway with the tails of various Caddys jutting out of the earth? Check it out sometime on Wikipedia– enter “Cadillac Ranch” in the search box. Speaking of classic cars in unusual places, on pages 24 and 25 of this issue, you’ll see some vintage Chevys on their adoptive streets of Havana, Cuba. I’m waiting for the right opportunity to head there myself– would love to check those old rides out! Our lead story this month centers on event coverage from Eckler’s Chevy Classics 38th International Convention in Norman, OK. We’ve got 10 full pages of all the results and great times– maybe you’ll spot your car here! The fun starts on page 6. 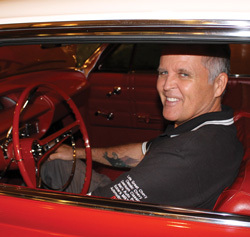 Feature cars kick off with Bill Picou’s incredible, all-original ’58 Impala. This car is a rolling time capsule! Check it out starting on page 16. Next up is Adam Morales’ big, beautiful land yacht– a ’66 Caprice, resplendent in its Chateau Slate paint hue and black vinyl roof. Our cover (and centerfold) car this month is John Provenzano’s ultra-cool ’56 Bel Air convertible. With custom touches in spades and style to spare, John’s car is something to behold. As far as tech is concerned, I think you’ll enjoy the special piece we have this month from Fred Weideman of Gene Smith Reproductions. Fred shows us what goes into the manufacturing of classic car parts– and it’s way more involved than you think!